Mankind first began to use steam in industry following the Industrial Revolution in the 18th century. Initially, steam was used as a motive source, to drive pumps, locomotives and the like. After a time, the use of steam as a motive source declined and instead steam began to be more widely used as a heating source. As you know, a characteristic of steam is that it condenses and changes to condensate when heat is used. In the beginning, the condensate was removed by either periodically opening a valve to blow out the condensate or by leaving a valve slightly open at all times to discharge the condensate while at the same time leaking steam (we touched on this in Steam Theory: What is a Steam Trap?). Removing condensate by manually operating a valve is not only very bothersome, but it also leaks steam. As the number of applications that use steam grew, a valve to automatically remove condensate was developed, and this was the birth of the steam trap. The first steam trap to make an appearance was a bucket type steam trap, developed in the first half of the 1800’s. The types developed in the early years of steam traps were a metal expansion type in the 1860’s, then an impulse type quite a bit later in the 1930’s, and finally in the 1940’s the disc type with which we are all familiar was developed. The latest technology is the Free Float® trap, which was first put into use in 1966. 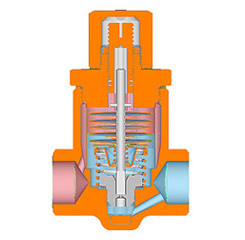 Cross-sectional views and summaries of each type of steam trap are found below. The cross-sectional views show the present-day versions of each type of trap. 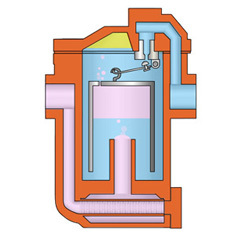 By means of the buoyancy of the cylindrical bucket, the valve at the top opens and closes to intermittently discharge condensate. Unlike the trap shown in the cross-sectional view (Inverted bucket Type), in early bucket type traps the top of the ‘bucket’ was open (Open Bucket Type). At the beginning, a straight metal rod was used which could expand when the temperature became high, closing the valve located to the end of the rod. This type of trap is no longer used in the present day, having been superseded by bimetal type traps. Two types of metal with different heat expansion rates are combined into a bimetal element. When the ambient temperature fluctuates the shape of the bimetal element changes, controlling the opening and closing of the valve and the discharge of condensate. From the outside, the adjustment screw is used to set the amount of steam that flows in through the flange on the piston valve and the amount of steam that flows out the hole down through the center of the piston valve. 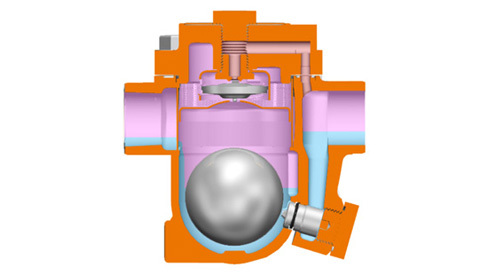 The upward and downward movement of the piston valve opens and closes the valve opening, intermittently discharging condensate. 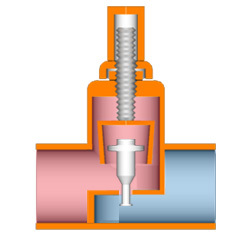 Pressure fluctuations in the chamber above the disc valve result in the opening and closing of the disc valve. Condensate is continually discharged while the size of the valve opening is controlled at all times by the amount of buoyant force acting upon the tightly-sealing float. The original floats were attached to a lever, but modern-day floats are spherical with the float itself acting as the valve. 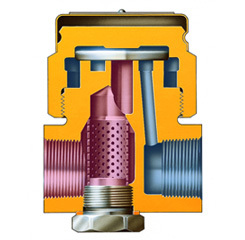 As we have seen, many different types of steam traps have been developed over the years. Each of the types we’ve touched on in this article is still in use today. Depending on the type (operation principle, construction) of steam trap, these features have their relative strengths and weaknesses. Additionally, the modes of operation vary among the different types—there are types that discharge condensate continually and types that discharge condensate intermittently. The combination of these gives each type of steam trap its special characteristics. In this article we’ve presented a rough history of the development of steam traps from their first appearance up to the present day. In The History of Steam Traps Pt 2 we’ll take a closer look at the construction and operation principles of each type of trap, as well as the changes each type of steam trap has undergone.